Twelve team are competing in the FIBA Olympic qualifying tournament for women in Madrid Spain. Only five teams will win a ticket for the Olympic Games in Beijing this summer. Spain had the ball for the first 45 seconds but were unable to score. They even managed a 24-second-clock violation. Fiji then surprised Spain with a trey by Valarie Nainima. On their very first attack Fiji took the lead after only 47 seconds. Spain then went on the attack and scored 19 unanswered points with Amaya Valdemoro (left) scoring 9 points. Nainima ended the Spanish onslaught with a distance floater just within the arc (5-19) with a little over five minutes played. Valdemoro continued her shooting festival. By the time she gave way for Alba Torrens, she had scored 15 of Spain's 30 points. Spain led comfortably 33-9 by the end of the first period. In the second quarter Spain played with their young players Laura Nicholls and Tamara Abalde are 19 while Torrens 18 (right in Picture. The line-up of Spain's young players was completed by Silvia Dominguez (21 years old right in picture No:11) and Maria Revuelo. Spain even with their young team on the court were too strong for Fiji. 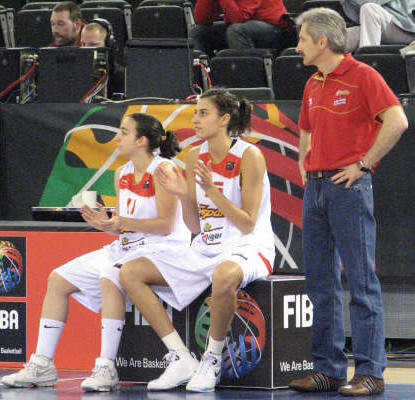 By the time Evaristo Pérez, the Spanish head coach, decided to bring Cindy Lima in in the game Spain's advantage had increased to (45-12). The remaining of the second period turned into a Spanish demonstration to go into the interval leading (60-12). Pérez used the rest of the game as a training session as turning his bench and running different plays. His side controlled the pace of the game and went into the final period with a commanding lead (87-22). Cindy Lima had a spell in the final period when she hit everything that touched her hand. She also had the honour of scoring the 100th point of the afternoon. Fiji never gave up and put up a fight in the final period but had nothing in their armory to stop Spain. The Spanish side went on to win 113-42 and will meet Brazil on Wednesday for their second match. The only scare for Spain came 25 seconds from the end when Revuelto went down holding her knee. 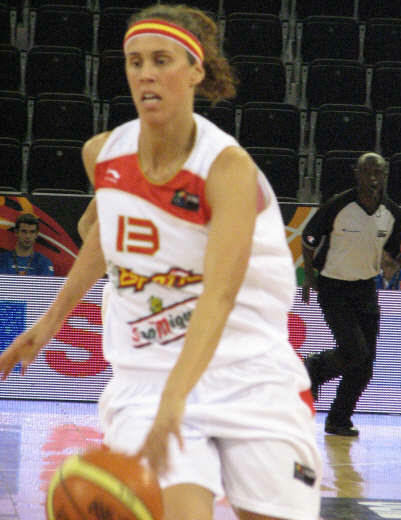 Valdemoro led the Spanish scoring with 24 points while Lima was next with 17 points. For Fiji Nainima scored 23 points. Cuba were rather slow at the start but were able to score their early points with drives from thr right side of the court to take an early lead (6-4) with Yamara Amargo doing most of the offensive action. China Tapie played at speed and with Chi When electrifying pace and steals they were quickly back into the game and with some big stops from Feng-Chung Chiang in defence Tapie before a trey from Chi When tied the game (13-13). Alberto Zabala the Cuba head coach called for the first timeout of the game and on the next play Yulizeny Soria hit a 3-pointer to bring the sides level again . However Cuba then allowed Chang to run right through the middle of their defence to score a lay up just before the buzzer for China Tapie to lead at the end of the first period (21-19). The start of the second period was rather scrappy compared to the first as both sides tried to play inside. This tactic suited Cuba and they regained the lead (27-25). The pace of the game slowed down in the third period which initially suited China Tapie as they hit 6 unanswered points to regain the advantage briefly. Yakelyn Plutin from Cuba had other ideas and scored 7 quick points for her side as they regained control. They also opened the first significant gap of the match and went into the final quarter leading (64-55). The Cuban's experience was the telling factor in the last period as they extended their advantage (81-62) with less than four minutes on game clock. Their opponents did not give in and made a fight of it during the closing minutes. But they were not able to bring the score down fast enough. Cuba went on to win (96-79) and will play Belarus tomorrow. First attack of the game and Bineta Diouf (left in picture) hit a three-pointer from the top of the key to get the game started. Latvia were quickly into their stride and Zane Tamane finished off a fast break on the very next possession to get her team off the mark. Anete Jekabsone-Zogota then put Latvia in front from a baseline jumper and quickly followed that up with a couple of free-throws and Latvia were on their way as the went on to score 27 unanswered points. This onslaught did not stop the Senegalese from playing hard or their few supporting in banking away on their drums. Latvia won the first period comfortable (29-5). Moustapha Gaye, the head coach from Senegal, decided that the players who were not playing would have to stand and watch the match from the behind the court during the third Period. Although Senegal were not able to reduce the deficit they kept Latvia in check for a few minutes.(23-54). In the meantime Ainars Zvirgzdins, the Latvian head coach, asked his players to speed up. They responded with a couple of three-pointers, which resulted in a 14-0 run. Latvia maintained their focus and went into the final period leading (70-26). For the last quarter the Senegalese players on the bench were allowed to sit down. Latvia had the luxury of resting key players as the bench players went to work to cruise to victory (94-34). Maria Gemena Landra from Argentina was given a long time to set herself up at the top of the key and hit a three-pointer to get the game started. On the other hand Argentina settled quickly and were soon leading (6-0). Hana Machova (left) then got the Czech Republic off the mark with a trey at 45 degrees. This shot got Metra Kulichova fired up as she scored 7 of her team's next 12 points as they took an early lead (15-12).Argentina were to level the game (15-15) by the mid-way point in the first period with Caroline Sanchez scoring her 8th point of the match. The two teams then stepped up defensively for the next 21/2 minutes blocking each other out at every attempt. Sanchez finally broke the deadlock from the free-throw line. She continued her one-lady demolition of the Czech Republic with a charge into the paint to finish with a lay-up. Sandra Pavon became the third player from Argentina to score to stretch their lead. Eva Viteckova ended Argentina's 10-0 run with a three-pointer. Argentina were to score the last points of the first period (25-18) of which Sanchez scored 15 points. The Czech Republic decided to have Petra Kulichova (left) and Jana Vesela watching Sanchez (right - No:14) at the start of the second period. With the Argentinean main offensive threat out of the way the Czech side went to work on making up their deficit and eventually took the lead after Katerina Elhotva hit a corner three-pointer (28-27). Sanchez finally managed to escape her markers and draw a foul which allowed her to get to the free-throw line. She made both free-throws but her joy was short lived as the Czech team scored on the next play. The Czech Republic had the game in control under the introduction of Sthefany Thomas Diaz whose energy in chasing - what appeared to be - lost causes rejuvenated Argentina and the teams were level again (34-34).The Czech Republic weathered the storm and finished the quarter to go into the interval with 3 points ahead of their opponents (38-35). Argentina came out firing at the start of the third period and werebeginning to unsettle their opponents as they reduced their deficit to a single point (39-40). Unfortunately for Argentina Sanchez then went with a suspected broken nose and had to be taken out of the game. The Czech Republic were able to accelerate the pace of the game and started to take command of it. The score moved from (47-43) to(62-46) in favour of the Czech Republic by the end of third period. Jan Boborovsky decided to rest players during the final quarter as his side had managed to break the resistance of their opponents in the third period. The game just played itself out with the Czech Republic winning comfortably (75-55).